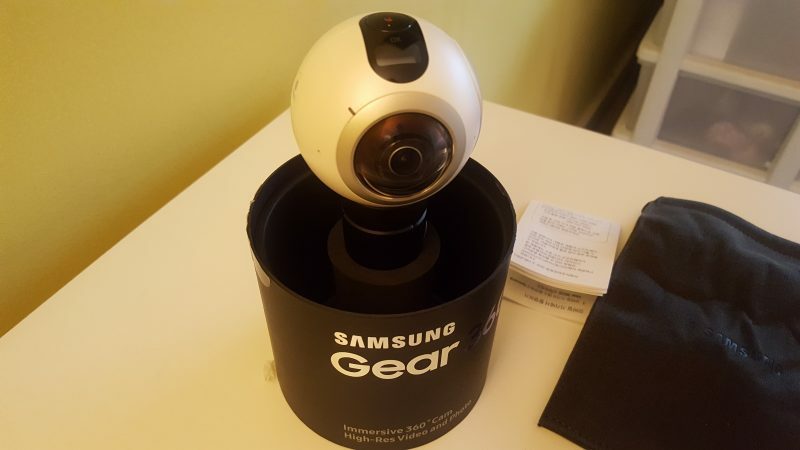 Even though the Samsung Gear 360 hasn’t been released in my country yet (the UK, although you can pre-order), I simply couldn’t wait to get my hands on one so I bought one on eBay from South Korea! It’s only taken 4 days to arrive and I’m now able to take a closer look at what is billed to be the most popular consumer grade 360 camera this year. If you would prefer to see an unboxing video, I’ve uploaded one to my YouTube channel here. My package from South Korea was very well wrapped and I was glad for the protection. Once I finally battled through the layers of bubble wrapping I was able to take a look at the main packaging. 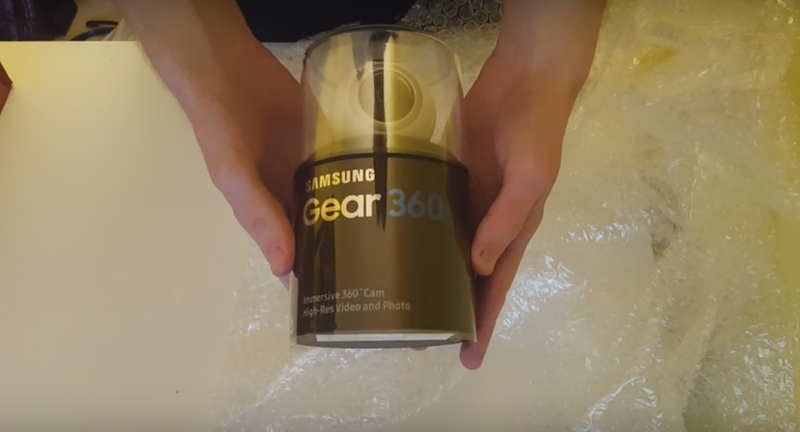 The Gear 360 is clearly presented in a sturdy cylindrical plastic case which I’ve decided to keep as it serves as a great storage place for when I’m not using the camera. The two plastic sections are held together by strong tape which may tear off some of the cardboard wrapping, so be careful if you want to keep the packaging pristine. Once removed I gain access to the camera which is already attached to its tripod, other accessories are stored underneath. 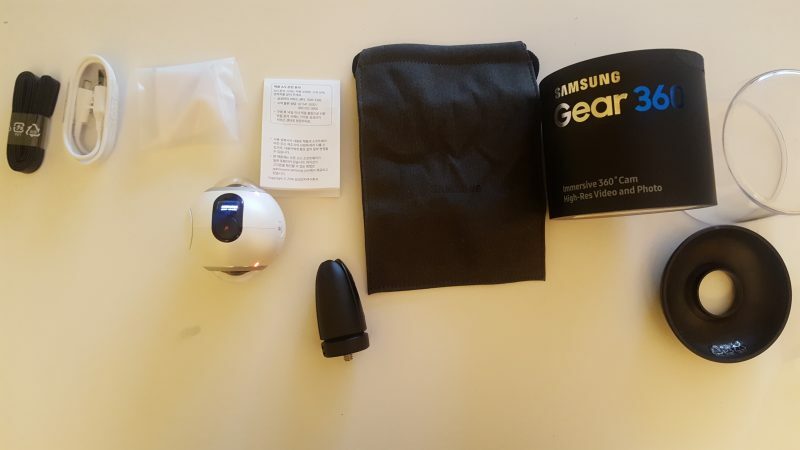 Samsung has provided an impressive array of accessories with the Gear 360; as well as a very sturdy mini tripod you also get a carry bag, cleaning wipes, a charger, battery and a camera strap. Also included is a small instruction booklet which has you’re unique product code. You’ll need the product code to download the Gear 360 action director (software used to manage and edit your 360 videos on desktop), so don’t lose it! Without even turning it on you can tell that this is a serious piece of hardware. While the camera is not large, it feels sturdy and heavy enough to be worth it’s £300 expense. The camera looks great too, very sci-fi esque, particularly when attached to the tripod. One thing to note is that it’s extremely easy to get smudges and fingerprints on one of the bulbous lens’s, which is probably why Samsung has included a cleaning cloth. The design is simplistic, with only a few buttons, a small LCD screen and a larger shutter. This camera is designed to be used primarily with it’s companion app, however you can still change settings and work the camera manually. Whilst the camera comes with its own mini tripod, and standard sized tripod or selfie stick will be usable with the Gear 360. To turn the camera on you hold down the power button, which also serves as the back key on the menu. The camera will activate with a flash of its LCD screen and multiple lights. The menu is fairly basic, it allows you to change between photo and video as well as using 1 lens or both. There are options such as time lapse and video looping which I’ll explore later. Camera settings such as ISO and white balance can be changed in the companion app, which I’ll be taking about in a full review once I’ve been given a chance to use it for a while. That’s about it for first impressions of the Gear 360 and so far, so good! I’m impressed with the amount of stuff Samsung includes in the packaging and the camera feels like a premium product, I just hope it lives up to this expectation. I’ll be spending the next few days using the camera, it’s companion app and the PC software in order to write a full and comprehensive review. 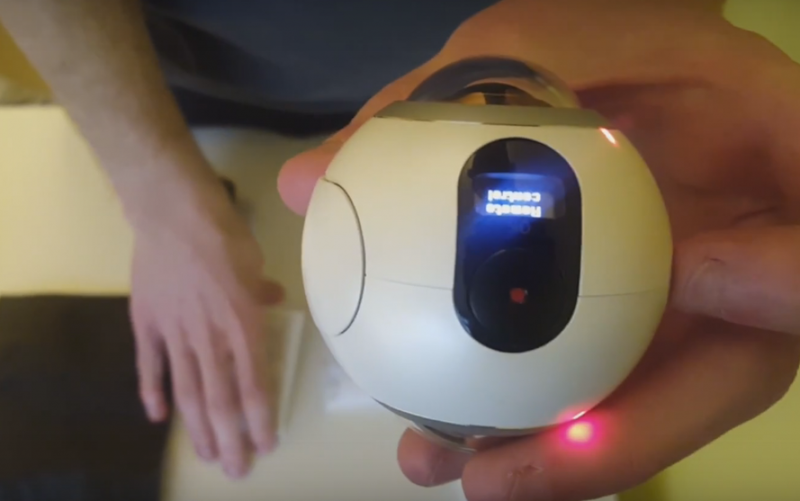 In the mean time, if you want more information about the Samsung Gear 360, go to this post or the official Samsung Gear 360 Website. 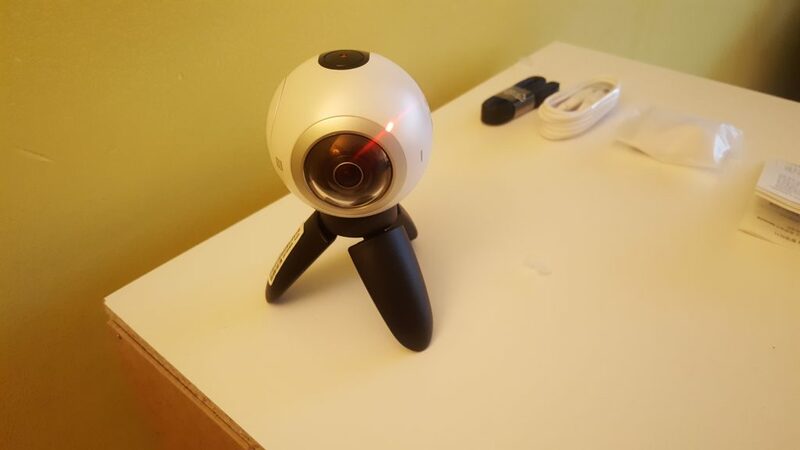 What makes a good 360 degree camera? Only Mobilefun in UK offer the preorder, price was 300gbp but now is 350gbp….